Coyote Blog » Blog Archive » Where? In Freaking Eloy? Have you looked into prediction markets? I think it's theoretically possible to short just about anything, although you probably won't be able to make much money since you'll find few takers for the other side of the contract. All you need to know about Eloy is summed up by the fact that the high school sports teams are known as the Dust Devils. My college roommate, who was from there, used the desire to escape as sufficient motivation to propel him through med school. Is this the "rock 'n roll" theme park they were touting a few months ago? 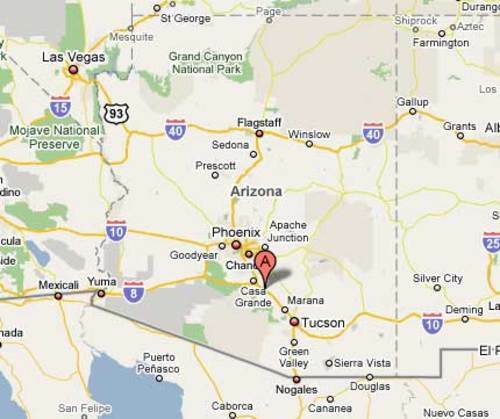 I thought that was a bit farther north on the reservation nearer Phoenix. In either case, it's a loser. For the record, I'm down with Coyote on this one. Sounds like the kind of project that only a pathetic opportunist, or a state senator could love: great photo ops, crap job-creation results. (So few great photo ops at the improved water treatment plant, though...Dang!) And what are they paying at amusement parks now, anyway? Is it more than minimum wage? Any bets about whether somebody has received favors from an amusement park equipment manufacturer? Lobbyists, gotta love 'em. But what should the banner at the ribbon-cutting say: "Amusement Park Accomplished!" ? What I would like to know is, cui bono? Who had the juice to get this thing moving in the legislature in the first place? Where can I buy stock in this thing. I lost my shorts in Salton Sea real estate and need to recoup. Thinking outside the box. Looks like a perfect site to view those elusive "Phoenix Lights" and maybe catch a glimpse of the mother ship. Capture the dinner crowd. Give the kids something to remember. I lived 45 minutes from Magic Mountain L.A. and I much rather have Hot and dry summer wheather at the park than Hot and humid. It gets to be 108 at the park in summer add that with 50% humidity. I think its a great idea and will create more jobs here in the desert.